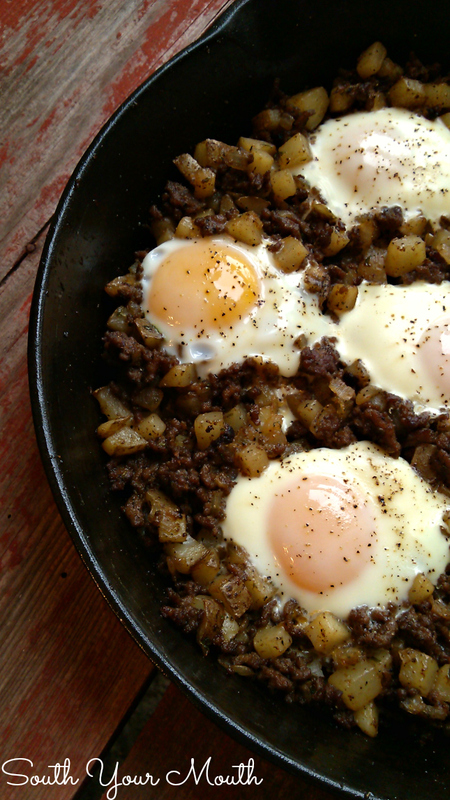 An easy, rustic one-pan recipe for breakfast, brunch or dinner made with ground beef, onions, diced potatoes and eggs. That’s about all I could manage to say when I took this out of the oven and looked at it. I don’t think I’ve ever seen anything so pretty in all my life! I didn’t even care if it tasted good at that point because it was so gorgeous! I mean look at it! Talk about starting your day off right! I was so full of it for the rest of the day, it didn’t matter what came my way. Yeah, I know I forgot to pay the cable bill and now you can’t get online. But did you see that hash??? No, you can’t nail silly putty to the coffee table. Do you want to look at my pictures of the hash and eggs instead? Who put crayons in the dryer?! No hash and eggs for you ever again! Ever!! And the best part? It did taste good! I tasted amazing actually! The egg whites sort of hold onto some of the hash so the servings lift out in these nice little bundles and the yolks are rich and silky and just coat everything perfectly! They cook up very much like poached eggs! And the other best part? It all cooks in one pan! I think this is the cleanest my kitchen’s ever been after cooking a big Sunday breakfast. I made some toast (which totally goes perfectly with this) and I was done and done! And the other nother best part? You make this with plain ol’ ground beef! All you need is some ground beef, an onion, a few potatoes, a half dozen eggs and you’re ready to rock breakfast out like a boss! Heat a large cast iron skillet (or other oven safe skillet) over medium-high heat. Add ground beef, onion, potatoes, salt and pepper and cook, stirring frequently, until beef is no longer pink. Add garlic powder, worcestershire sauce, paprika and parsley and continue cooking until potatoes are tender. Preheat oven to 350 degrees. Reduce heat to medium-low. Using the back of a spoon, make 6 indentations in the hash. Don’t go all the way to the bottom of the pan, just make a little well large enough to cradle the eggs. Break one egg into each indentation. Season eggs with additional salt and pepper. Cook on stove until whites are mostly set and only partially translucent. Carefully move skillet to oven and bake at 350 degrees for 4-7 minutes or until whites are cooked through and yolks are cooked to preference. Serve with toast! I doused mine with a fair amount of hot sauce too and it was delicious! Also, this would have been amazing served with fresh chopped parsley or even a little fresh sage. Note to self: plant massive amounts of herbs next spring. *You're going to want to dice these into small cubes. I didn't peel mine but you can if you prefer. **Try this recipe with a big batch of this scrumptious French Toast or this heavenly looking Cinnamon Roll Breakfast Casserole if you've got a crowd to feed! That does look good, especially on a cold night ! We are having record cold tonight in N. Florida ! Yum! Looks perfect for Tuesday night diner (tonight!!!). Side salad (kale, pink lady apples, pecans, dried cranberries and grapes) and toast. Oh thank you!!! Good Lord Woman! 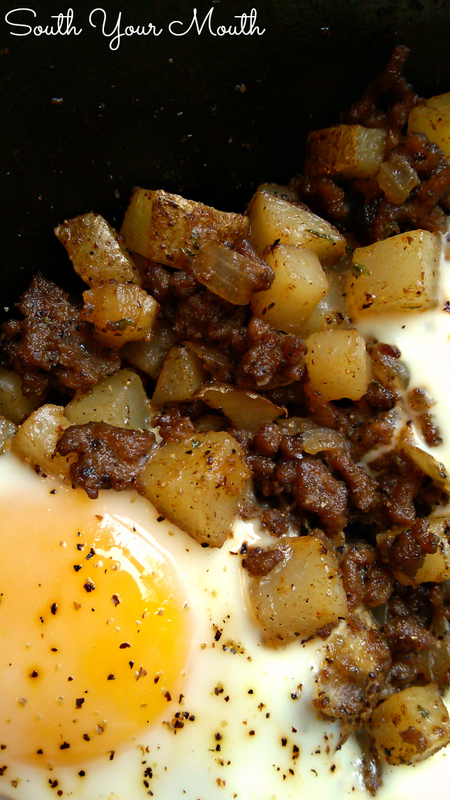 I LOVE me some hash, and I am going to be all over this come Saturday morning! Get it girl! Good to hear from you, friend! Oh my! I agree. Sounds so yummy. please whats an alternative for worcester sauce? If you "Google" or do a web search for Worcestershire Sauce alternative you will see many options. Difficult to substitute for I think. You could also just leave it out or spice meat however you like it. We loved it and I most definitely will be making it again! Thank you :-). Would Ore-ida frozen diced potatoes work? Just curious. I am planning on making this on Sunday morning! Can't wait! I imagine it would but I've never been a huge fan of frozen potato texture. I'd go with fresh but if you decide to go with the frozen let us know how it turns out! Sounds and LOOKS yummy! Did you drain the hamburger or skip that step with this recipe? 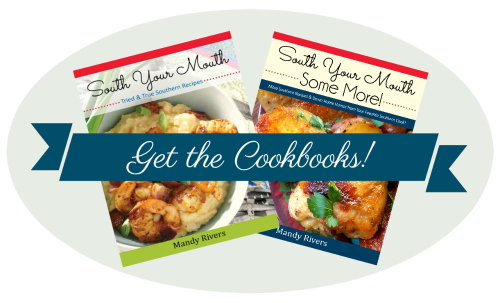 Thanks for all your great recipes and fun commentary! Don't drain. You need the liquid and fat to cook up the potatoes! Saw this and immediately thought it was Corn Beef Hash, one of my favorites, and then realized it was Ground Beef....? I made it last night and it definitely did taste like corn beef hash! Especially the ground beef that was crispy. It was delicious! Ohmygoodness! ! I have made this twice, first with frozen potatoes, second time with unpeeled potatoes that I diced myself. AMAZING! Both times. Your recipes are always winners. Thanks!! It looks really yummy! An addition to my breakfast list.I maybe making this for tomorrow's breakfast! Could left over corned beef for substituted in this? If so, would I still use the Worchester sauce? Hmmm... yes, I think so. I'd add a little fat (bacon grease or vegetable oil). You'll also need to add a little water to help cook the potatoes since it won't be getting any moisture from the ground beef. The worcestershire would be up to you. I'd probably leave it in. Very good. Big hit with my wife and kids. I had to add a little extra seasoning and I threw some dried herbs in as well (including ground savory which I thought paired pretty well with it). Also, I would recommend just frying up some eggs and throwing them on top of the individual servings if you want the yolk nice and runny. Enough time in the oven to finish off the whites meant solid yolks. Not as good. More time on the stove might have solved this but would've burned the other ingredients. 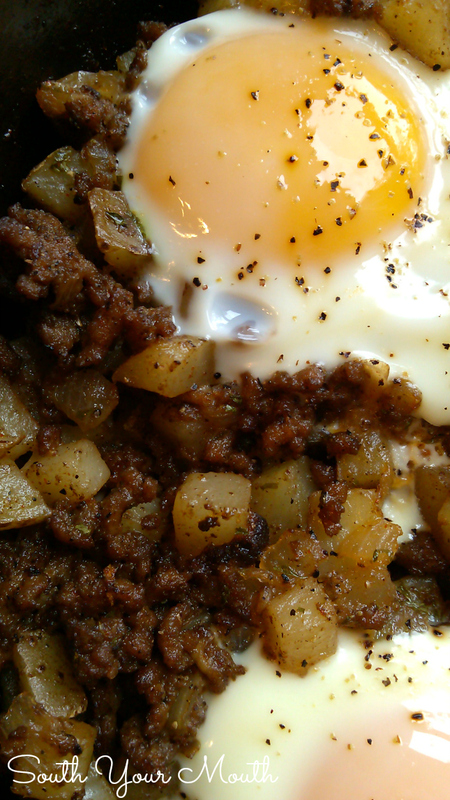 I used a can of diced potatoes added them just before the eggs took less time (hungry family) and came out delish! Love this recipe! It was delicious and inspired me to create a version using sausage and country ham. Instead of putting in the oven to cook the eggs,put a lid over the pan. Cook until the whites are set for runny yolks or longer if you like your yolks cooked. Made this tonight after needing something quick with ground beef and potatoes - delicious! Thanks! This looks amazing! I can't wait to try this with roasted cauliflower instead of potatoes. Lower carb and just as delicious! We eat this for supper. It's one of our favorites! Especially covered in Frank's Hot Sauce!